Last year, the Indiana Hoosiers finished 12-20. It was Tom Crean’s third season as coach, and those 12 wins were the most for the Hoosiers during his tenure. Crean needs the team to improve this year; he could lose his job if they don’t. So far, he’s getting that. Indiana is 11-0 and the only team to have beaten third-ranked Kentucky. As the Hoosiers prepare for the beginning of the conference play, they’re a top-20 team with a chance of challenging Ohio State for the Big Ten crown. The key to Indiana’s turnaround has been defense. Two years ago, the Indiana Hoosiers allowed 99.1 points per 100 possessions, according to KenPom.com’s rankings. That made them the 109th-best defensive team in the nation. This season? The Hoosiers are giving up just 90.3 points per 100 possessions (adjusted for pace), good enough for 25th in the country, and that includes the game against high-scoring Kentucky. If the help hadn’t been in the middle of the paint on that possession, Jones would have driven to the baseline and finished at the rim. Indiana’s team defense means opponents can’t attack them one-on-one anymore; instead, they go one-on-three or one-on-five against the Hoosiers, because all of Crean’s players understand where they need to be to help against penetration. In the video’s second highlight, Kentucky’s Jones has the ball again, but this time he’s at the top of the key. His teammate Doron Lamb fades out on the left wing to give Jones a driving lane, but Lamb’s defender knows he isn’t a threat 30 feet from the basket. 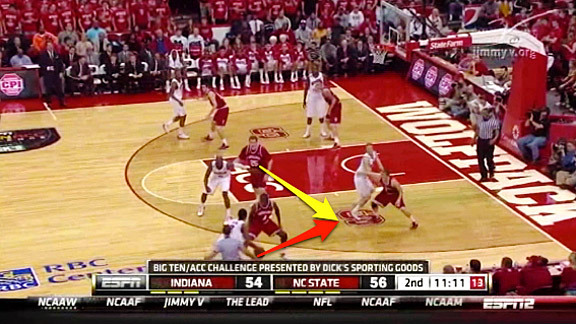 So instead of sticking with Lamb on the outside, the Indiana defender stays in the driving lane, ready to help. 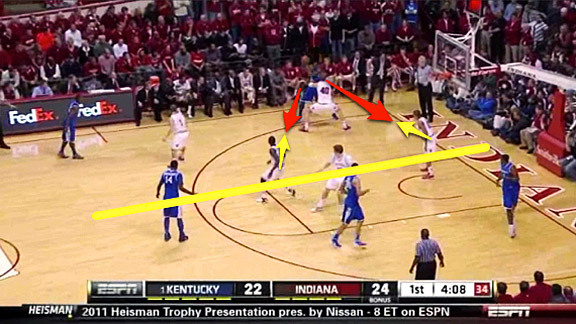 When Jones drives, the help is waiting, and Indiana forces a steal. Proper defensive rotations don’t just help against isolations. They also improve the way a team defends spot-up shooting. With the Hoosiers’ improved team defense, it should be no surprise that their opponents’ spot-up shooting numbers have decreased. In the 2010-11 season, Indiana’s opponents scored 0.998 points per possession on spot-up opportunities, a number that ranked the Hoosiers 398th out of the 570 teams tracked by Synergy Sports. This season, that number has decreased to 0.816, which ranks them 146. In this possession, a Howard offensive player drives toward the lane. His dribble penetration forces Verdell Jones III, who was in help position as the Howard player made his move, to leave his man. The help makes the offensive player pick up his dribble and look to pass, while the player Jones had been guarding fades out to an opening on the perimeter. The ball handler kicks a pass out to his teammate, who is briefly open for a jump shot, but Indiana’s Matt Roth rotates over from the corner to close out on the shooter. Closing out his hand high and only jumping after the shooter leaves the floor, Roth contests the shot and helps force a miss. One reason that Indiana’s defenders are so willing to leave their men and play help defense is that they know the rest of Indiana’s defense has their back. Sure, the initial defender gets beat, but Jones helps because he knows that if the ball is passed to his man, another teammate — in this case, Roth — will rotate over. 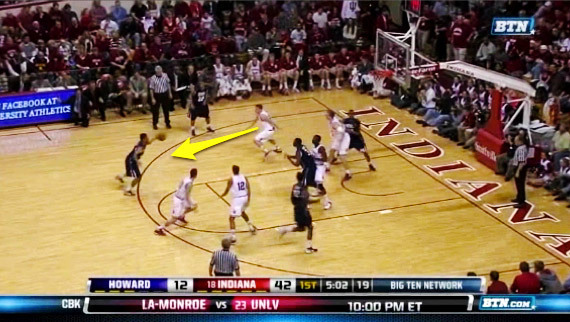 Sometimes, the initial help is good enough for Indiana that it allows the help defender to return to his man and challenge the shot. Here, an NC State player on the wing drives to the baseline. Seeing the dribble penetration, Indiana’s Tom Pritchard leaves his man to prevent the ball handler from getting to the paint. Watching Indiana play defense, you can see that the players really trust each other. 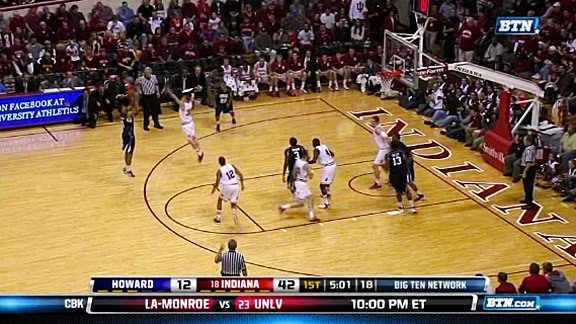 There is rarely, if ever, any hesitation when an Indiana defender helps. This is because he always knows there will be another teammate getting his back and rotating over if the man he left gets the ball. 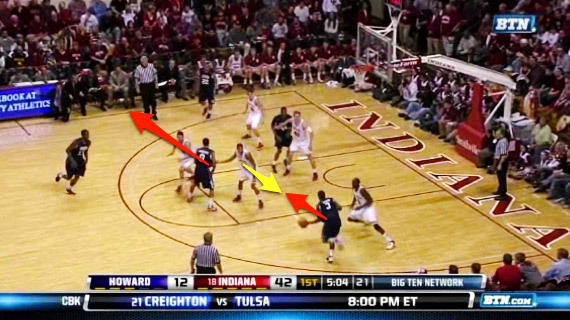 Perhaps the best indicator of how strong Indiana’s defense has been this season is how little zone they have played. Two years ago, Crean, who never has relied much on zone defenses, was forced to play zone 13.6 percent of the time. Crean apparently didn’t trust his team’s man-to-man defense back then, so he used zones to hide his team’s poor defenders. That didn’t work. Indiana was one of the worst zone teams in the country that year. It allowed offenses to score 0.953 points per possession against its zone, which was bad enough to put it in the NCAA’s bottom third. This year, Indiana has played zone on only 2.7 percent of its defensive possessions. Crean trusts his players and knows that his help defenders will be where they need to be. So will Indiana keep this up? I think it can. If it was a team relying on its offense heading into Big Ten play, I’d be worried, but defense is its calling card, and that is a perfect fit for the rugged (and slow) Big Ten. Will the Hoosiers go undefeated? Of course not, but their defense has put them in a position to make the NCAA tournament for the first time since 2008.